Last Saturday, I joined about 70 other ultrarunners for the Ruth Anderson 50k/50m/100k run around Lake Merced in San Francisco, CA. I had hoped to try a "loop course" run for the first time this year, and the 4.47-mile loop around scenic Lake Merced (mixed road and trail) was a great introduction to this format. The Ruth Anderson 50k/50m/100k honors ultrarunning veteran Ruth Anderson. It didn't take much asking around to find out Ruth was a true pioneer for ultrarunning/masters sports both on and off the field, and has been making contributions to ultrarunning for over 25 years. 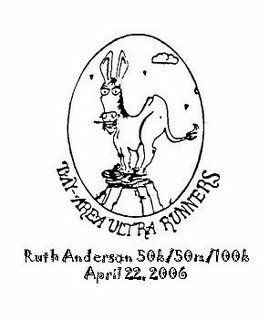 If you would indulge me a few paragraphs to learn a bit about Ruth, you'll understand why participating in the Ruth Anderson 50k was so much fun. Winning the 1980 USATF 50-mile Championships at age 51, clocking a 7:10:56. Becoming the first woman ever to enter the London-to-Brighton 54-miler (where she ran a 7:46:16). Winning the womens 70+ division at the 1999 USATF 50k Championships at Sunmart..note this is 19 years after her first USATF championship. Ruth was also an advocate for ultrarunning off the track. 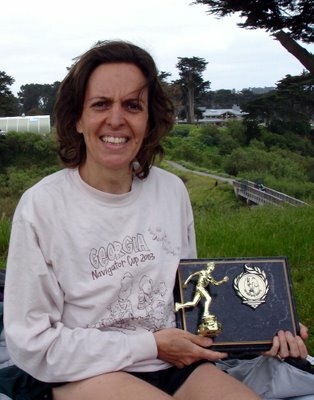 In the past, she has managed the national US 100K team, advised the MUT Running Council, and pioneered the first USATF Ultrarunning Subcommittee to help recognizing "ultra running" as a unique class of running. Ruth also helped masters sports and women get recognized within USATF by advocating with other atheletes for the "40+" category, among other things. For her contributions to the sport, the USATF created the Ruth Anderson Award to recognized the most outstanding female ultrarunner of the year (last year this went to superstar Anne Lundblad). So basically, Ruth Anderson rocks. At 5:30am on Saturday, I arrived at the start with plenty of time. Time to ponder, that is, why I was doing a 50k only five days after doing the Boston Marathon. Although we had done the Boston marathon at a comfortable pace, it's generally a good idea to give your legs at least a week of rest, especially after running on pavement. You don't want to run the risk of hurting yourself half way through your second race and being tempted to "walk it off for 17 miles". That could end your season for sure. This is what makes a loop course like the Ruth Anderson 50k/50m/100k so perfect for days you would like to play it safe. Not only would you pass your car every 4.5 miles, but you could choose your final distance along the way. If you hit 50k and felt good, you could go for 50 miles just by indicating you would like to continue. And you know exactly what the course is at that point, since you've done the loop 7 times. I figured I would not set any expectations, listen to my body, and see how the race went. When the gun went off at 6:30am, we all cheered and started what would soon become the longest right hand turn any of us have ever made. I paced with the front group for the first lap - Chikara Omine, Mark Henderson (whom racers were calling "Texas" due to his home state-colored shorts), Eric Blumenau (who won the 50-mile last year in 6:20:58), and John Hintz. Chikara and Texas were going long today (100km), while Eric and John were targeting 50 miles. 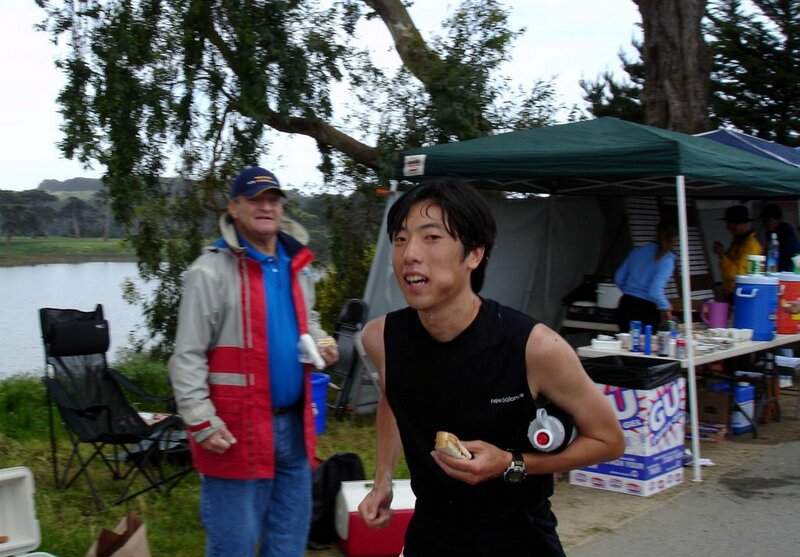 As we got to know each other, we found out that all of us were going to be at the Miwok 100k in two weeks as well; Eric would be volunteering to ensure the course was marked, and the rest of us would be racing. The weather was perfect for going fast (cloudy, about 53 degrees), and we set an aggressive pace of just under a 7-minute mile for the first three laps (12.9 miles). Chikara and Texas were a good match for the 100km, with Chikara's raw speed and Texas' tempered experience from Badwater and many other ultras. Despite the fact they were going 100km, they were setting the pace for all of us. Eric had done very well at the 50-mile last year, but let us know that his first year at USF law school was taking its toll on his training. But here he was, tough as nails, and in the lead pack going stride for stride with John Hintz. As the runners spread out a little bit, I cranked up my iPod (Raconteurs, Gorillaz, My Chemical Romance) and found myself still feeling good at the end of lap 4 (17.3 miles). The only sign of Boston was my hip flexors were a bit tight. We were still averaging a 7-min mile, which was very fast for me. As I thought about why the fast pace felt so comfortable, I realized it came down to three things - the optimal weather, running with a fast group, and the growing familiarity with the course. But I still had a long way to go, so I hung in there. 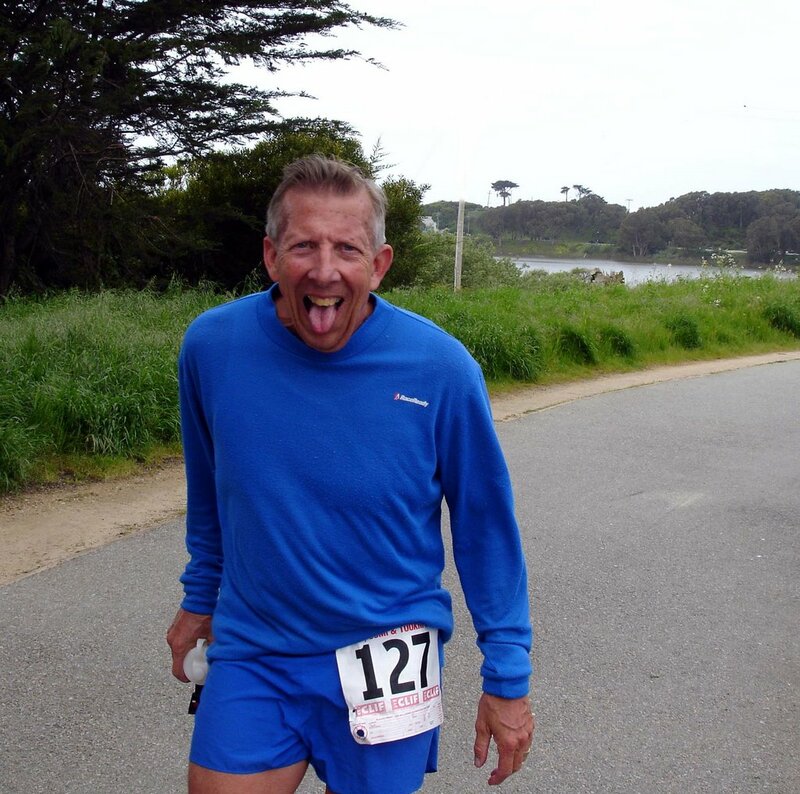 The 4.47-mile Lake Merced loop is quite flat, with less than 150 vertical feet per lap. There was enough variability that you could shift your dominant muscles every mile or so, and a nice dirt trail beside the paved bike path for most of it. We joked about "the hill" at mile 4, because it seemed like nothing on the first lap. But with every lap, it seemed to grow bigger and bigger. ;-) It was a multi-use trail too, so there were plenty of pedestrians to navigate. A car accident had launched a smashed sedan up on the bike path, presenting a new obstacle for a few laps. None of these were enough to limit the pace, however. As I finished lap 5 (21.8 miles), I hit the expected "wall" that always comes about this time of the race and slowed down about 30 seconds/mile to let my body regroup. Chikara and I had discussed earlier that the "walls" seemed to come exponentially - 10 miles, 20 miles, 40 miles, and (as we had heard from others) 80 miles. The 20-mile point didn't seem to slow down the lead pack too much, and Chikara, Texas, and John Hintz began pulled ahead of me by 4-8 minutes. I wasn't alone, however. Due to the loop format, I had a chance to see a lot of ultrarunners I typically only see at the beginning and the end of the race. Mike Sweeney was looking good, as was Dieter Walz (who holds many 70+ ultra records already), and 17-year-old newcomer Spencer Frasher. Everyone was enjoying the nice cool weather, and the rowdy crew competition going on in the lake. I crossed the marathon mark in about 3:09, and my body was still holding up remarkably well. I had carried the slower pace from lap 5 into lap 6, since the shorter strides kept the pressure on my hip flexors at bay. It didn't feel like the "bad kind of pain", just the "good kind of pain" (I know, I know - we're all nuts). I noticed that the familiar loop terrain made it much easier to analyze my physical situation and fine tune my stride. Lap racing is a good format for finding out your "A" game. As I started the final lap, I realized I was still on a sub-4 hour pace for the 50k. Was that possible?!? How could I be on pace to take more than 20 minutes off my 50k PR just five days after Boston? Maybe the runners high was messing with my computational skills. But John and Amy Burton (the Race Directors) confirmed my pace as I hit the aid station one last time. I drank as much water as I could, and pushed the pace for one last lap. 35 minutes later, I crossed the finish line in 3:52:15, good for first overall. I pulled off my tag to indicate I was done at 50k, and my legs sighed with relief. Daughter: Daddy, where do PR's come from? Scott: That's a good question, sweety. Where do you think they come from? Daughter: Lots of training and a focused race? Scott: That's true. But sometimes they come when you least expect it. If you're having a good time and running with friends, anything is possible. Maybe even a PR. Daughter: Will I ever have a PR? Scott: When you try your first race, I guarantee you'll have a PR. You can even start when you're 46 and still be a world champion, just like Ruth. Scott: Haven't you heard the story about Ruth, the fast and courageous ultra-warrior? Daughter: Is it story time again? Joy! As I recouped, I was able to cheer on the other racers as they came by. Chikara was still going strong, but Texas had slowed a bit due to stomach issues and was talking about going 50 miles instead. 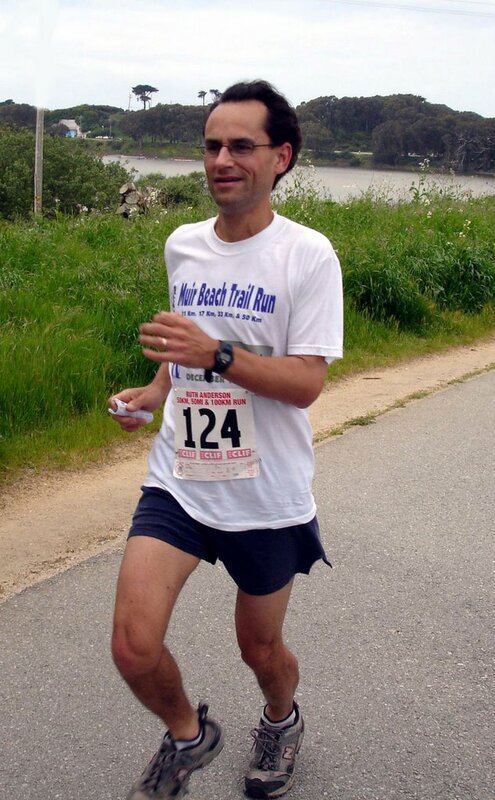 John Mintz still led the pack in the 50-mile. Willem van Dam came in about 12 minutes behind me for second place in the 50k (and a new PR of 4:03:45), and Patricia Zerfas (from Maryland) had come in for third, winning the women's title and demolishing the previous women's record by almost 15 minutes. Ruth would have been proud! In the end, Chikara held on to win the 100k in as astounding 7:42:10, with Mark Tanaka coming in second, and Mike Sweeney coming in third. Wendy Georges won the women's division in 10:53:27. John Mintz held on for victory in the 50-mile with a 6:30:12, with Texas finishing second just two and half minutes later. Soon Gaal won the women's division in 9:52:56 - a perfect way to celebrate her birthday! Spencer Frasher held on to become the first 20-and-under 50k finisher (and, of course, set a PR). Dieter Walz broke two records, first by breaking his own 70+ national 50k age group record in 5:13:36, then continuing on to set the 70+ 50-mile record for this course in 9:35:18. He is amazing. All in all, everyone made the most of this gorgeous day to set personal PR's and push course/age group/national records. My thanks to RD's Amy and John Burton, past RD Steve Jaber, Stan Jensen and the many volunteers of the Bay Area Ultrarunners Club for putting on a great race. I would highly recommend it, particularly if you're a first timer, or are looking to set a new PR. You'll find this race to be fun, collegial, and a great way to find out what you're capable of. Plus you'll have the "power of Ruth" to get you to the finish line. Many thanks to Dan Brannen and Theresa Daus-Weber, and Linda Wallace for their prior research on Ruth Anderson and Masters Track, respectively. You can find more photos of the race here. Scott, your blog is one of the best out there. You put me[and most of us probably] to shame with your constant participation and racing. Your race reports are thorough and excellent reads, and I almost feel as though I am there with you on many of them. You really are living...and it helps the rest of us folks realize that, even if we cannot race and travel constantly like you, we can take some baby steps too...to do the un-ordinary. One trip to a destination race. One goal fantasy race. I think you could market your site to some sponsors if you so desired. The content is great, updated frequently, and with a lot of visitors. Anyway you slice it, you are providing content that a great many of us are enjoying above all that other crap on the internet. Thank you. congrats on placing first....nice report..
Congrats on the placing. Keep on blogging, evidently you have a lot of us fans reading daily. Nothing short of amazing 5 days after running Boston. Wow. Good job!! I am sincerely flattered by all your positive feedback, guys. Thanks for letting me know! If you keep reading, I'll keep running/writing and keeping it positive. I completely agree with Jennifer about doing the "un-ordinary". I continue to be most inspired by the runners attempting their first marathon/ultra/trail run/etc. Just doing one is incredibly courageous, and helps keep your optimism front and center. Now I really don't have any excuses anymore to delay hitting the hills in order to attempt my first trail marathon later this year...given that most of my training runs are on trails and I don't really like the road much (but then I had to try and make it a bit easier first time round for me). Congratulations all round once again! We would like to thank all the wonderful volunteers who gave up their Saturday to help make the race a success! Thank you to Stan Jensen, Ken Reed, Jim Pommier, Kristina Irvin, Mark Seaman, Cammie Dingwell, Jeff Jones, Brie Reybine, Lee Blaine, Marianne Paulson, Bob McPhail, Bryan Wyatt, Mike Webb, Georgia Gibbon, Mark Magers, and Mike Mahone! Thank you all so much! We definitely also want to thank Steve Jaber, who organized the race for the past 7 years, for helping out again this year with a large portion of the planning and work in order to make the handover to the new race directors as smooth as possible. Thank you Steve! Thank you also to BAUR -- Bay Area Ultra Runners (www.baur.us/) for sponsoring the race. Check out their website if you wonder why your award has a donkey logo! Special thanks to Gillian Robinson and Don Lundell of ZombieRunner (www.zombierunner.com/) who provided the excellent goodie bags as well as the Gu2o energy replacement drink. Check out their website for all kinds of cool stuff! We also want to thank Chrissy Weiss of Dirty Girl Gaiters (www.dirtygirlgaiters.com) for her sponsorship. Hopefully the new gaiters will inspire everyone to get out on the trails and give your body a rest after all that road running! We want to thank Cliff Bar (www.clifbar.com) who generously donated the Cliff Shots and Cliff Bars, as well as a Cliff log banner that made an excellent wind stop, helping to keep some of the volunteers a little warmer. And thank you also to All Sport Running (www.allsportrunning.com) and The Schedule (www.theschedule.com) who apparently placed ads for the race on TV the night before the race. Definitely well worth the $25 bucks we paid them to list the race on their website. This is a great blog, keep it up. I ran my first ultra 2 weeks ago and in the race packet was Trail Runner Mag and you were in there in the "runners to know" section. Have you noticed an increase in traffic here since it mentioned your blog address? I am getting a steady rise of new readers, but it's hard to say exactly where it comes from. We got a big boost from the Forbes award in late 2005, and any time we have a lot of bloggers link to a story we get a good jump. I'm sure the TRM magazine is helping. I do have more people come up and say "hi" at the races, which is nice. It's always great to meet new trail runners.